So, a bit belated but the Kings College War Studies podcast had two great episodes recently that focused on Counterinsurgency and I highly recommend them. The first is an interview with Lt. General Jonathan Riley and Professor Theo Farrell. The General is from the UK who has lots and lots of experience in combat zones all over the world, including Iraq and Afghanistan. He was the deputy commander of coalition forces in Afghanistan in 2007 which makes his candor in this interview all the more interesting. The first two, at least, appear fairly straightforward and should be within the capabilities of the coalition to acquire and absorb. Yet, apparently that didn’t happen. Provincial Reconstruction Teams don’t work. They don’t report to ISAF but instead report back to their individual national command structures which essentially precludes any sort of unity of effort. The second podcast addresses the issue of counterinsurgency more broadly. In particular they talk about the concept of counterinsurgency and how COIN chic has evolved and where it might be headed. There isn’t anything specific I’d like to pick out here but it’s a nice primer on COIN, the debates surrounding the concept and how COIN theory might evolve post Iraq and Afghanistan. From the broad back down to the specific, the New Yorker has an interview with Dexter Filkins and Steve Coll about Afghanistan and what it will likely look like after 2014. Let’s face it, there aren’t many ways to paint Afghanistan in a good light today and these guys don’t try. It’s a mess and as Steve Coll says, what we leave behind isn’t going to be pretty and might not be any better than when we found it. the focus on Iraq. Planning for Iraq clearly began early and even if no ‘official’ decisions were made, the US was keeping its powder dry and wanted to be able to pivot quickly to Iraq. Whether to engage in ‘nation-building’. There was a general reluctance to help build governing institutions or coordinate aid programs. That was either seen as somebody else’s job or…who knows…a bunch of liberal do gooderism? Underestimating the Taliban and equating them with al-Qaida. This esentially eliminated the opportunity for any negotiations and encouraged the insurgency to rebuild their strengths and capabilities. This also led, in some parts of the country, into the Taliban beginning to morph into a national liberation movement. Failure to account for Pakistan. Both the overt support of elements of the Pakistani government but also the pourus border. Obviously, pretending the problem didn’t exist was not a winning strategy. The Afghan government we established (or, as Dexter called it, a ‘Vertically Integrated Criminal Enterprise’). Just a mess from top to bottom. 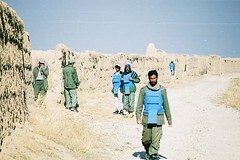 Our weak attempts to claim early on that Afghanistan was soverign and therefore the U.S. didn’t want to meddle too much in internal affairs wasn’t effective because everyone knew that we were the only thing keeping the Afghan government going, both with military and financial support. Who believes we’d give all that money and then not demand some sort of accountability? In the end, they have a corrupt, inefficient government and it looks like we’re the puppet masters. The ‘surge’ of 2009 didn’t do much other than check the Taliban’s momentum from 2007-2008 leaving us in a stalemate. We therefore failed to break the Taliban’s back which we thought would establish our own momentum for nation building and drive them to the negotiating table. The unfortunate thing about these hail mary pass type moves is that if they fail your opponent can now be confident that they’ve taken your best shot and they can now wait you out. In 2014, expect news stories from Afghanistan (if anyone will be writing such things) to be all about the new civil war and the wisdom of the pundits will be ‘well, that place is just naturally ungovernable…nobody could build a state there.’ It’ll make everyone feel better but it won’t be true. Coll makes the interesting observation that ‘nation building’ was easier in the 19th century than today. I wonder if that’s just because it was easier to use brutal methods then, if there was some cultural component (from the point of the occupiers, the occupied or both) or something else. The depth of goodwill most Afghans had upon our entry into the country is hard to overstate. Even by 2003/2004, you could feel it among the population. We had it for years and refused to capitalize on it and by 2009 had to build a population-centric strategy in order to win the population over. For me, that’s one of the key missteps of the war that demonstrated an inability to see the critical components of this war. Dexter thinks a ‘best case’ scenario (in terms of trying to prevent Afghanistan from sliding into chaos and civil war) will involve a commitment of approximately 15,000 troops for 20-25 years. That might work, provided casualties stay low but if insurgents can pull off a Kobar Towers-like incident I imagine the patience for continuing that mission would be pretty limited (which will play in well with the pundit narrative I mentioned above).